In this cool game you can dress up a famous Kitty from “Hello Kitty”. This white kitty is a very famous character of the Japanese culture. 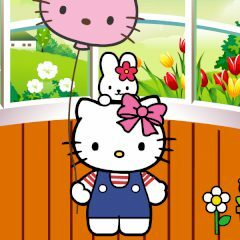 Here you can dress up kitty and choose her pretty bows, flowers, balloons, toys and also you can decorate her room. Go with her to amusement park and have fun!